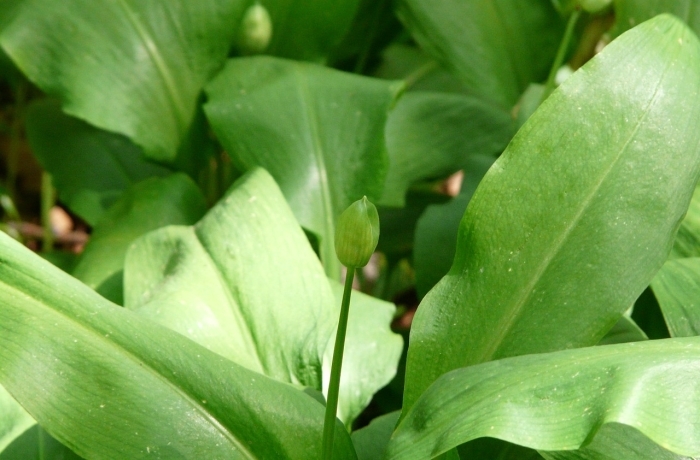 Take advantage of the punchy flavour and health benefits of wild garlic (Allium ursinum) flower buds before they flower, by pickling the buds to preserve them. Around now in April, the long, pointed leaves become topped with a haze of starry, six-petalled white flowers. The blossoms emerge from their pale green, pointed bud parcels (as pictured above), arranged in clusters of 10 to 20 on a three-sided stem which is triangular in cross-section. 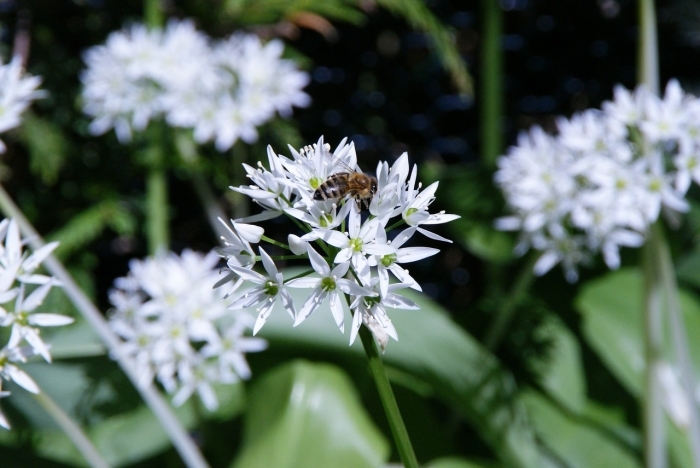 Wild garlic flowers are an early nectar source for butterflies and bees, so take only as much as you need, and take care not to take too many buds or flowers from one spot. Mind your step too as some plants, such as native bluebells, are sensitive to trampling. Enjoy your pickles as a piquant, garlicky garnish, in salads, on canapes, with cheese and crackers, etc. 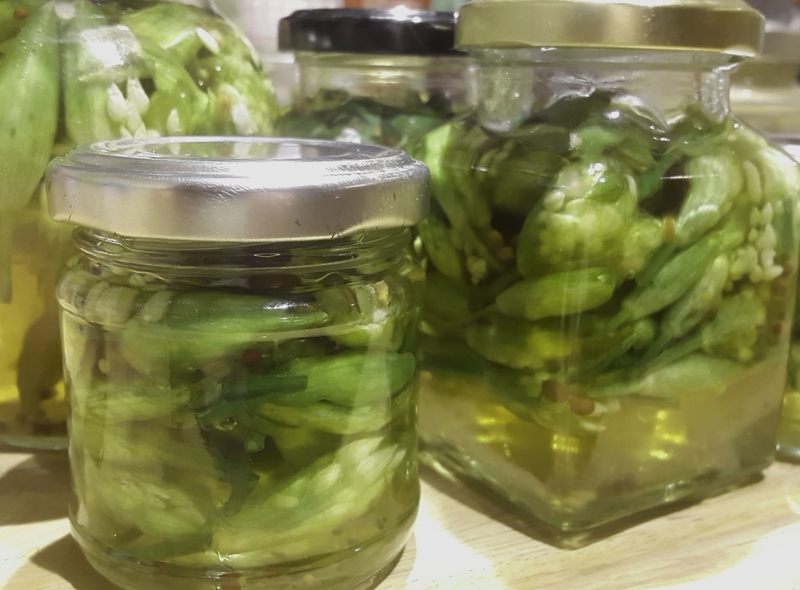 First sterilise a jar and a vinegar-proof lid to fit your wild garlic buds. Pack the buds tightly into your jar – almost to the top as they’ll shrink when the hot liquid is added. Heat the vinegar, sugar, salt, spices and bay gently in a pan (enamel is best, avoid aluminium) until the sugar dissolves. Then bring to a gently bubbling simmer for a couple of minutes and remove from the heat. Pour the hot, spiced pickling vinegar over the buds to cover them and up to about a centimetre from the top of the jar – the buds will float. Leave for a minute or two to allow the vinegar to start to penetrate the buds and for the liquid level to settle, then slowly raise and lower a clean chopstick or plastic blade around the inside of the jar to remove air bubbles. Top up with vinegar if necessary to about a centimetre from the top of the jar, then seal the jar. Leave to mature in a cool, dry place for 2 weeks to a month. Make sure you carefully identify any foraged plants you’re planning to eat to 100% certainty with a good field guide, or three. If in doubt, leave it out. If you’re still not sure exactly what to look for, come on a foraging course with an expert. Discover more about identifying and cooking with wild edible plants on a Wild Feast foraging & cookery course. Get wild food and drink tips and updates on course dates on Facebook, or sign up for my e-newsletter (option to unsubscribe at any time). 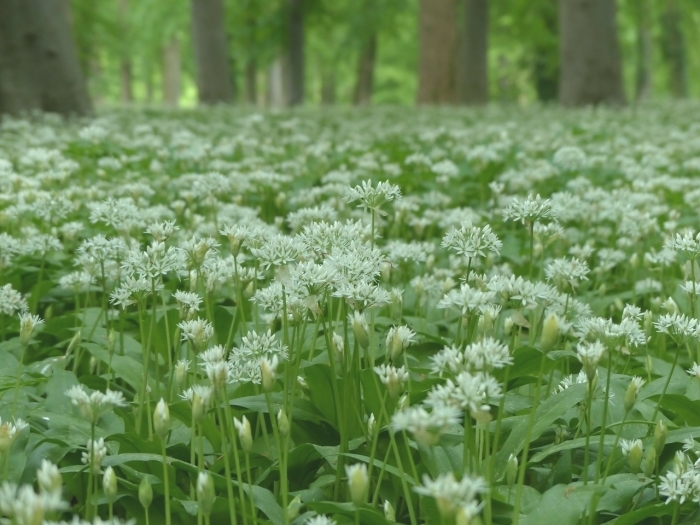 If you’ve caught an oniony waft while passing through woodland, you’ll know wild garlic, otherwise known as ramsons, is in season. This flavoursome wild green that often grows in abundance is eagerly awaited by foragers – and there’s so much you can do with it! I’ve listed some cooking ideas and recipes in this post, as well as identification and harvesting tips – so there’s no need to miss out on this wonderful wild harvest! The young leaves of this onion-family UK native (Allium ursinum) are tender and silky with a delicious garlicky, peppery flavour that’s more delicate than cultivated, raw garlic. It grows over most of lowland UK, often in dense swathes, in deciduous woods, woodland edges, on stream banks and shaded hedgerows and verges, preferring rich, damp soils. Bright green wild garlic shoots can appear as early as January or February, with the season starting in earnest in March and continuing until around May for the leaves, and June for the seedpods. From April the long, pointed, spear-shaped leaves are topped with a haze of pretty, starry six-petalled white flowers arranged in ‘umbels’ with three-sided stems (triangular in cross-section). There’s some evidence we may have been eating wild garlic since the Stone Age – little wonder as it’s so good for us! 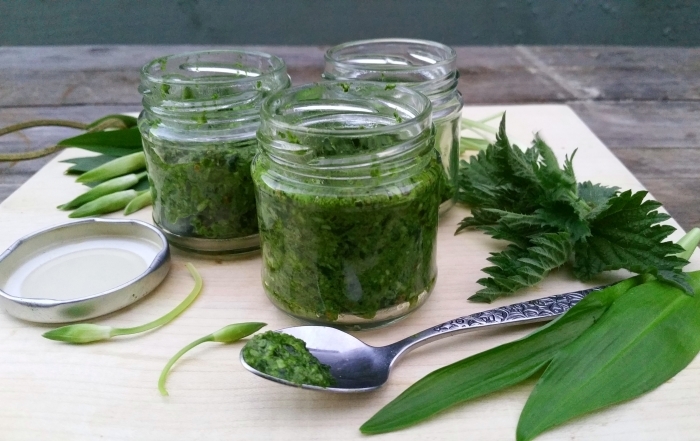 In today’s cuisine, raw leaves are used in salads, mayonnaise, dressings and herb butters – scroll down for my recipes for wild garlic dip and wild garlic and nettle pesto, including a vegan version. The leaves can be preserved by lacto-fermentation (I use this simple method by forager Robin Harford) which alters their flavour profile somewhat, but the ferment still packs a punch. Fresh leaves can be infused to make flavoured vinegar, or shredded to use in all sorts of recipes, such as risottos, curries, pasta dishes, mash, omelettes, stir-fries, stews, sauces, soups, and to stuff meat or fish. 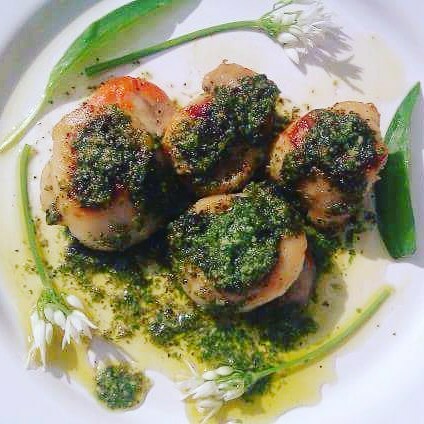 Wild garlic is great in savoury bakes too: bread, scones, muffins, oatcakes…the possibilities are endless – I’ve even used it in savoury cocktails! The pretty flowers are also edible, try them fried in a light tempura batter, or use them as a decorative, savoury garnish. The green flower buds and the hot, peppery, little seed pods (before they develop a hard seed) can be pickled to make wonderfully garlicky ‘capers’. Wild garlic leaves keep well in a bag in the fridge for a few days. I find the flavour stronger before flowering, and cooking reduces the potency because the leaves’ volatile oils evaporate quickly, leaving them much milder and sweeter. So for maximum flavour, add them in the last minute or so of cooking. As wild garlic often grows in damp places, the leaves can be gritty, so wash them well in several changes of water. If you’re serving raw leaves and are concerned about bacteria in soil (it’s mostly good but some can be harmful), my tip is to soak the leaves in a 1:10 vinegar to water solution for a couple of minutes, which should be enough to neutralise any baddies. Not only is this foragers’ favourite delicious, it’s also super-healthy! Wild garlic contains high levels of vitamins A and C, as well as minerals including calcium and potassium. Studies have shown that wild garlic contains more magnesium, manganese and iron and than cultivated garlic. The leaves especially are a source of potentially potent antioxidants which could help protect against cancer and support the immune system. Recent Romanian research concluded that the antioxidant level appears to be highest in the raw leaf within the first few hours of processing. Wild garlic contains ‘uridine’ which may be mood-lifting and good for brain health, according to studies, especially when paired with fish oils – fortuitous then that wild garlic goes so well with mackerel! The fresh plant has been shown to have antibacterial, anti-fungal and anti-inflammatory properties, and it contains antiviral plant lectins. It’s also said to be a digestive tonic, perhaps that’s because it acts as a prebiotic, promoting the growth of good gut bacteria. 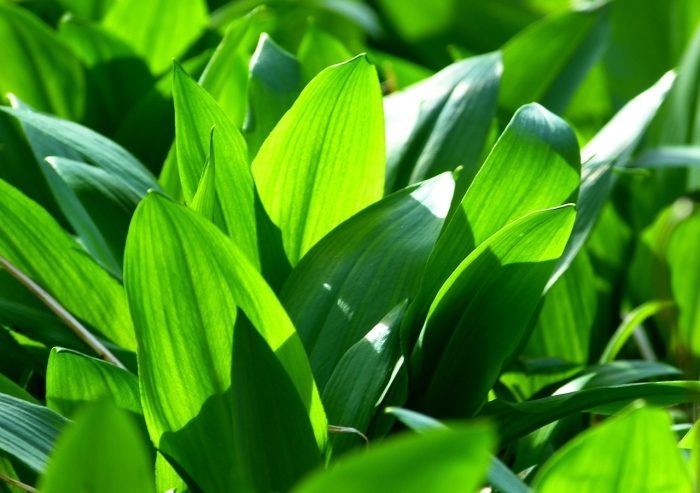 Wild garlic leaves are typically rich in sulphur compounds which protect the heart. In comparative trials, wild garlic proved more effective than cultivated garlic in reducing blood pressure and LDL cholesterol in rats, while raising HDL cholesterol levels. Wild garlic could be confused with a few poisonous plants. Cuckoo Pint or Lords and Ladies (Arum maculatum) is a common plant that often grows amongst wild garlic. It burns the mouth due to the oxalates it contains and could make the throat swell and obstruct breathing. So pick each wild garlic leaf individually care, checking as you go. Cuckoo Pint has arrow-head shaped leaves, although be aware that the two pointed ‘tails’ on either side of the leaf stalk may not be developed when the leaves are young. 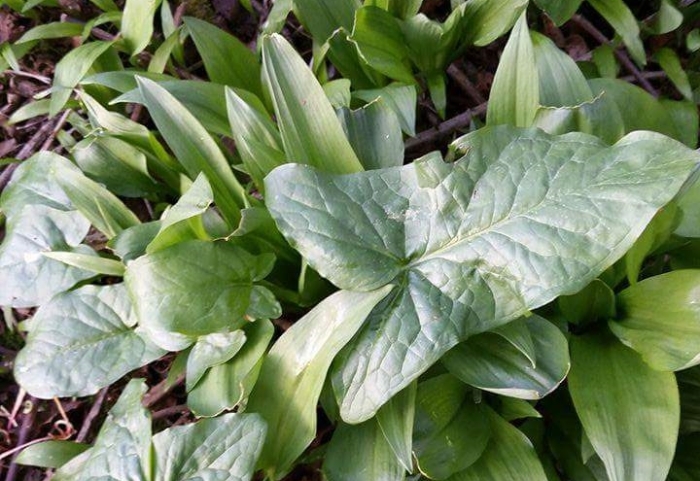 The leaf veins of cuckoo pint are arranged in a ‘network’, whereas the veins of wild garlic are parallel – and wild garlic leaves have a distinctive garlic smell, of course. The leaves of highly poisonous Lily-of-the-Valley (Convallaria majalis) look similar to wild garlic, but there are two leaves per stalk growing from the rhizome, whereas wild garlic only has a single leaf on each stalk arising from the bulb. The less widespread but deadly Autumn Crocus (Colchicum autumnale) produces its leaves in spring too, but they’re thicker and glossier, more like a garden hyacinth. When picking wild garlic, take only as much as you need and spread your harvest by taking a leaf or two from each plant, minding your step as some woodland plants, such as native bluebells, are sensitive to trampling. Wild garlic flowers are an early nectar source for butterflies and bees, so take care not to take too many from one spot. The plant is an ‘ancient woodland’ indicator species, which means if it’s found along with enough other indicator plants, which include rowan, yellow archangel, wood sorrel, snowdrops and wood anemones, there’s a good chance the woodland is over 400 years old. Although they’re edible, I don’t take wild garlic bulbs from the wild as it’s illegal to uproot plants without the landowner’s permission, it prevents the plant from regenerating and they’re small and fiddly to clean. In the right conditions, wild garlic can be persuaded to grow in some gardens, but beware as it can get quite invasive. Always use good identification books to identify your foraged finds to 100% certainty before eating them – if in doubt, leave it out! And if you’re still not sure exactly what to look for, come on a foraging course with an expert. Raw wild garlic can be pretty overpowering, but earthy nettle is the ideal partner to tone it down, making a perfectly punchy, super-healthy pesto! You can keep this in the fridge for a couple of weeks and it also freezes well. For me, pesto is a very personal thing, so do adjust my recipe proportions to your own taste. Pick over and wash the wild garlic leaves well and chop roughly. Wash the nettle leaves wearing gloves, and then steam them for a minute or two, or blanch them briefly in boiling water – cooking them denatures the sting. You can use them raw, but you need to blend them really well to make sure they don’t sting. Once cooled, squeeze out excess water from the nettle leaves (the nettle water makes a great soup stock) and chop them roughly. Meanwhile dry fry the nuts or seeds in a pan, or toast in the oven, until pale golden brown. Whizz all the leaves in a blender with half the lemon juice, the vinegar and enough of the olive oil to loosen the mix. Add 40g nuts (or for the vegan version, add an extra 20g to make it up to 60g and nutritional yeast)*, process until smooth enough for your liking and stir in the grated hard cheese. Then stir in the remaining olive oil as needed, the rest of the lemon juice to taste, and season with salt and ground pepper. Serve with pasta, potatoes, soups, toast, crackers, breadsticks, fish, shellfish, meat, as garlic bread…or straight from the jar! Be aware that there’s a risk of botulism with unpasteurised, fresh plant material stored in oil. It’s a slight risk, but a very serious one (although rare, botulism is potentially fatal). So to be on the safe side, I recommend storing home-made pesto in the fridge and using it within two weeks. Otherwise it’s best frozen. *Note the vegan version of the pesto comes out paler green than the non-vegan pesto in the photo due to the extra nuts and the colour of the nutritional yeast. 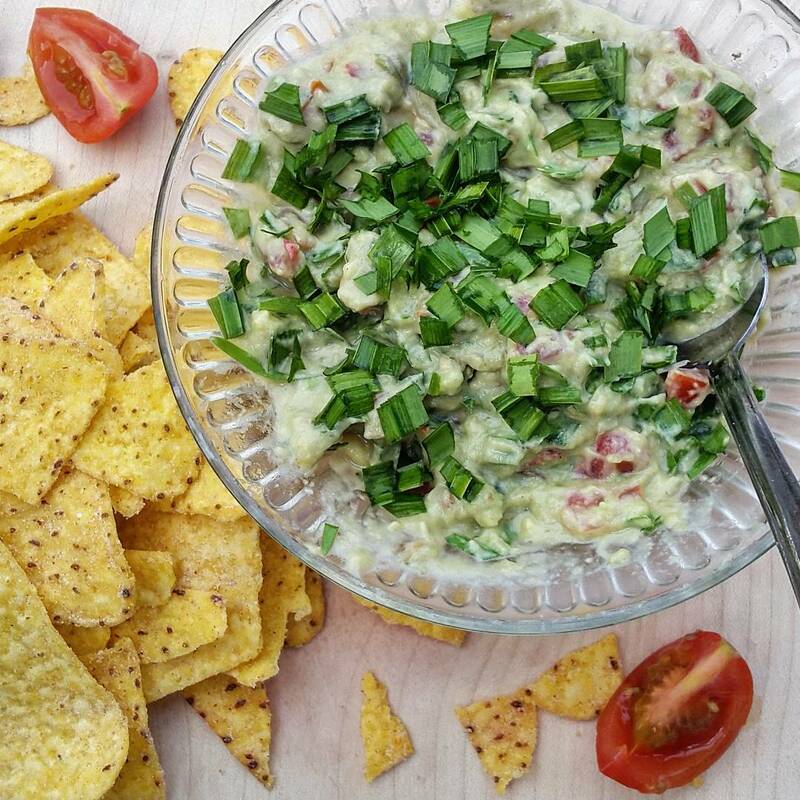 You don’t need much wild garlic to make this simple and deliciously moreish, garlicky dip, popular with both kids and adults, but not especially breath-friendly for entertaining! 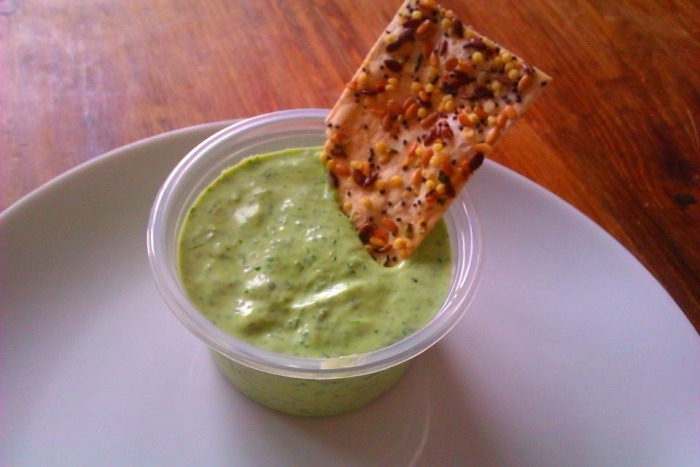 If you’ve made wild garlic pesto, you could stir that into cream cheese to make an even quicker, convenient version of this dip. Pick over and wash the wild garlic leaves well and chop roughly. Whizz them in a blender with the cream cheese and the grated hard cheese until the mixture is smooth and pale green – add just a few to start with, blend and add more to taste if desired. Stir in the crème fraiche or sour cream, then the lemon juice, salt and ground pepper to taste. 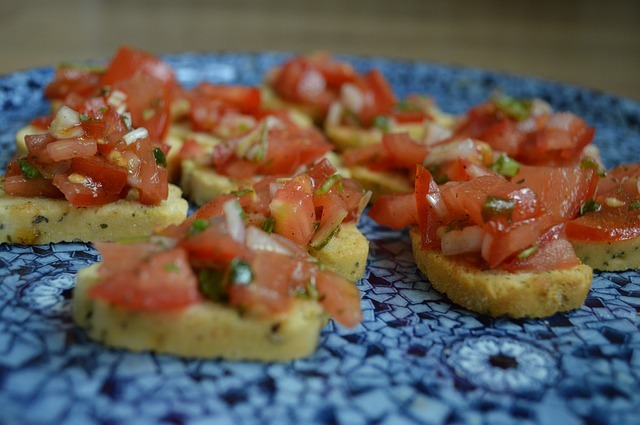 Serve with breadsticks, crudités, or whatever takes your fancy. 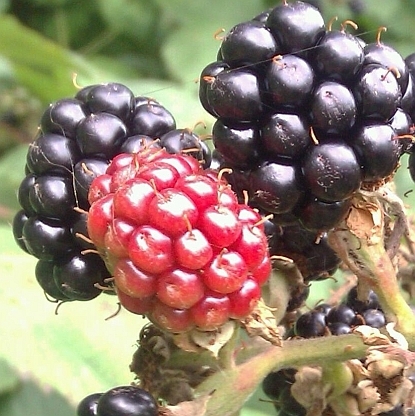 Due to its mix of tart and sweet, blackberry lends cocktails, from gin and vodka to scotch and bourbon, a good sweet and sour balance as well as rich flavour. Here I’ve gathered some of the tastiest cocktail recipes from around the web, using blackberries. Some of these cocktails use a delicious French-style blackberry liqueur, which can be easily be made at home: Infuse around 250g blackberries with 70cl vodka and 100g sugar for around three months (add some citrus zest if you fancy) shaking occasionally, then strain through a fine sieve, or muslin. You can then filter again if you want a clear liqueur – coffee filters do the job. Add more sugar to taste if required, shake regularly again until the sugar has dissolved, then decant into a sterilised bottle and seal. Your liquor will benefit from maturing for a few more months – if you can wait that long! October is the tail end of the blackberry season, but don’t worry if the berries are getting a bit seedy or aren’t very sweet, because sugar is added to the infusion and it’s filtered before drinking. Although if the berries are over-ripe and soggy, mouldy, tasteless, or just don’t taste nice, they’re past it! Alternatively you may have some stashed in the freezer. The Hedgerow Sling from Absolut Drinks is a sour style of cocktail using sloe and lemon juice along with blackberry liqueur. Their Bramble Mimosa mixes floral and rich berry flavours in a twist on the Kir Royale. Champagne (or you could use sparkling wine) tops up Chambord black raspberry liqueur, blackberry liqueur and elderflower cordial. 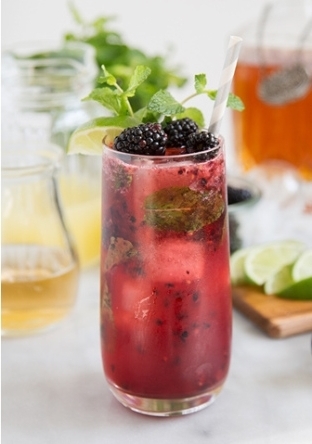 This Blackberry Bourbon Smash (above) from The Little Epicurean muddles fresh blackberries with mint leaves, agave, lemon and ginger ale to make a long bourbon cocktail. A Blackberry Gin Smash is a fruity alternative to traditional G&T, adding fresh blackberries muddled with lime juice. A couple of these cocktail recipes use simple (sugar) syrup. Don’t buy it – it’s simple and inexpensive to make at home..here’s how. Discover more about identifying and cooking with wild herbs and flowers on a Wild Feast foraging & cookery course. Get wild food and drink tips and updates on courses on Facebook and sign up for my e-newsletter for wild food & drink recipes direct to your inbox (option to unsubscribe at any time). 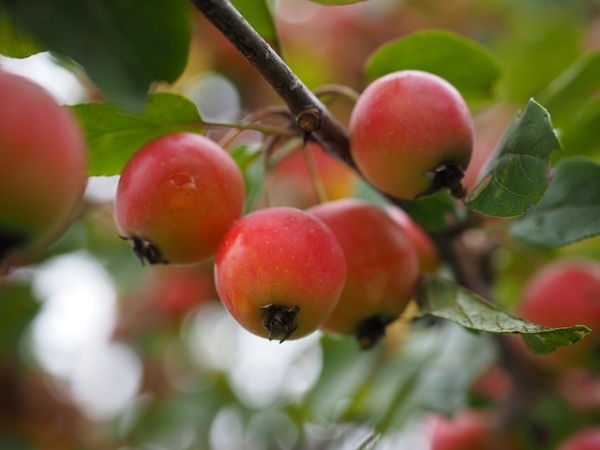 The original native crab apple tree (Malus sylvestris) is a valuable wildlife habitat and food plant that’s now uncommon in the wild. The abundant, fragrant blossoms attract bees, and birds and mammals eat the yellow-green fruit. The wild native species is a smallish thorny tree of woodland edges and hedgerows with a habit of becoming ‘crabbily’ gnarled and twisted. But there are also many cultivated, ornamental varieties and species of crab apple, and apple trees from discarded pips growing wild also tend to produce small ‘wildling’ apples. 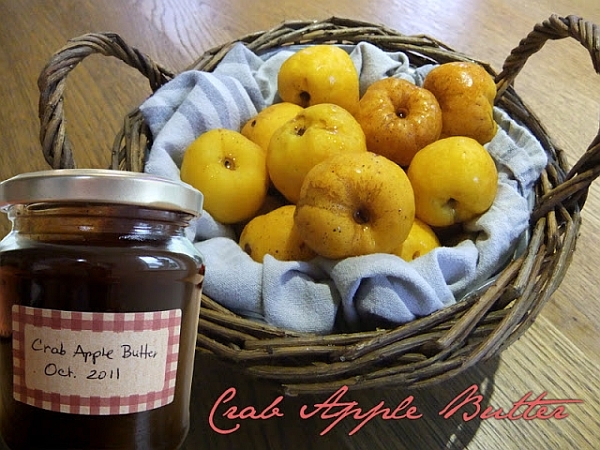 Whether cultivated, wildling or wild, crab apple fruit is usually somewhat sour, bitter and dry-tasting but this intense apple flavour works well in many recipes, including drinks, which makes it a wonderful ingredient in my eyes! Crab apples are in the rose family – Rosaceae. The deciduous leaves are arranged alternately on the twigs and can vary in shape, but are roughly oval or round with a pointed end and finely serrated edges. As the tree grows older, the scaly, greyish bark becomes cracked. The five-petalled flowers are white or pink with numerous yellow stamens, and appear in April and May. I love the variety of crab apple fruit, they can range in diameter from less than a centimetre to around five centimetres, and can be oval as well as round. 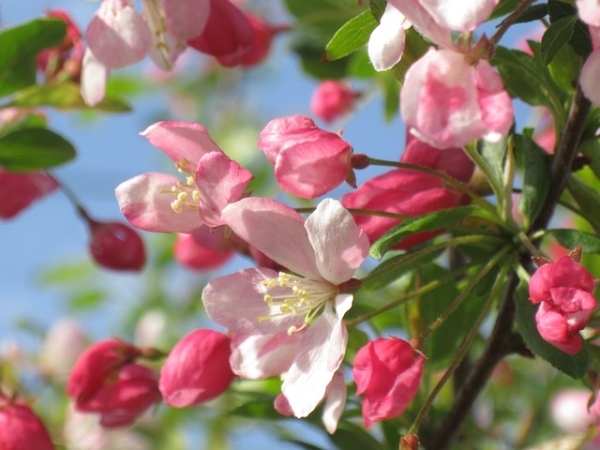 The little apples may be green, yellow, red, or prettily flushed with pink or red. The fibrous stalk is long in relation to the size of the fruit when compared to a standard sized apple. Cutting the apples in half at right-angles to the stalk reveals the distinctive five-pointed star-shaped apple core where the seeds (pips) develop. The fruit is ripe when it begins to fall off the tree and the seeds turn brown. Crab apples, like all apples, contain some vitamin C and may contain significant quantities of antioxidant compounds, such as anthocyanin (the dark red pigment in some apples) and quercetin which may help prevent cancer, asthma and diabetes. Crab apples are also high in pectin, which has been shown to help reduce cholesterol levels and may reduce the risk of heart disease. There’s something in the old saying ‘an apple an day..’! Like all apples, the skin, and just under the skin, is where the nutrients are most concentrated, so to get the most of the beneficial compounds, process and eat the skin along with the flesh. 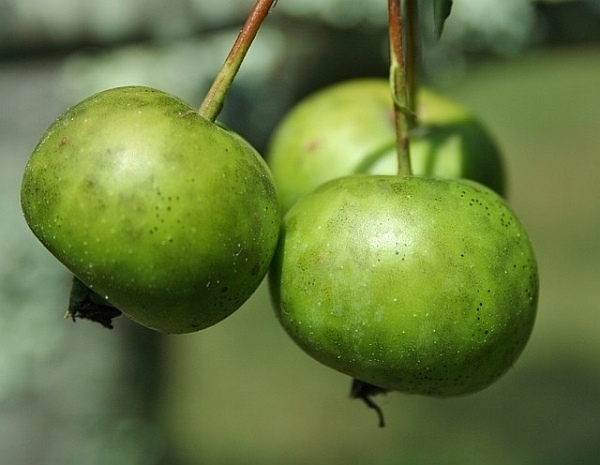 Crab apples have long been associated with love and marriage. Apples were thought to have magical powers and the Celts knew them as the tree of love. Folklore says that if you throw crab apple pips into the fire while saying the name of a lover, if the lover is faithful the pip will explode in the heat, but if they are not, the pip will burn silently! Always use a good plant identification book when foraging, and remember to leave some fruit behind for the wildlife. Crab apple leather makes a super snack, here’s a recipe from The Hedgerow Cookbook. You need to spread out the puree to about 5 or 6 mm thick with a spatula or spoon before drying in a low oven (50°C is ideal – for that you may need to prop your oven door slightly open), or a food dehydrator. You can add other fruit, flavourings or spices to the mix such as cinnamon, fennel seeds or hogweed seed. I’d advise removing cores and stones at the start if you can, that way you can blend up the fruit skins and get the benefit of all the nutrients concentrated there. Try crab apple, orange and cider jelly in gravies and sauces, as an accompaniment to roast pork or cheese, or it’s delicious enough just to spread as it is on buttery toast. This fab recipe’s from voluntary community group West Ealing Abundance which uses London fruit that would otherwise go to waste. What about a spiced crab apple (or quince) butter from Gail Duff’s Country-side Cook Book for spreading over cakes or on warm scones. Or try Hugh Fearnley-Whittingstall’s blackberry and crab apple cordial. And last, but certainly not least, here’s Abel & Cole’s recipe for crab apple whisky, make in autumn/fall in time for Christmas! With its intoxicating scent, curvy Art Nouveau-style blooms and understated pastel yellow and blush-pink hues, honeysuckle is surely the most elegant wild flower, not to mention one of the most deliciously-scented. Even its name, Lonicera, sounds like a siren of the silver screen. 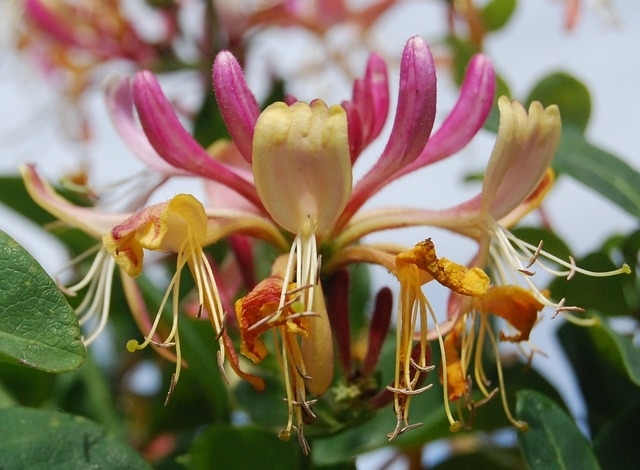 There are many species of honeysuckle, some of which may be toxic to varying degrees, and UK native Lonicera periclymenum is the one to forage for. It’s a twining shrub with opposite pairs of untoothed, pointed leaves and stalkless, trumpet-shaped flowers arranged in whorls. It takes just a small quantity of the fragranced trumpets to capture their honeyed, floral notes. Honeysuckle-infused water can be used to make refreshing sorbets, cordials or conserves. The latter goes very nicely with some thick slices of ham, or in a summer cream tea with the addition of some fresh raspberries or strawberries. To make honeysuckle syrup, steep a few small handfuls of flowers in enough water (just off the boil) to cover them. Leave overnight at room temperature, then pop in the fridge to infuse for another day or so. Strain through muslin into a measuring jug, and add equal quantities of sugar to liquid along with the juice of half a lemon for each 500ml. Put into a saucepan and bring to the boil slowly, stirring to dissolve the sugar. Simmer gently for 4 minutes, then funnel into sterilised glass bottles and seal, or let the syrup cool and transfer to sterilised plastic bottles for freezing. Use the syrup to make a vinaigrette, jellies, or for a refreshing drink, add chilled fizzy water and a splash of citrus juice, or even yuzu. Honeysuckle syrup goes well with brandy in cocktails, or here’s one to try with gin. In summer, wild honeysuckle can be found flowering in woodland, scrubland, hedgerows and along roadsides. 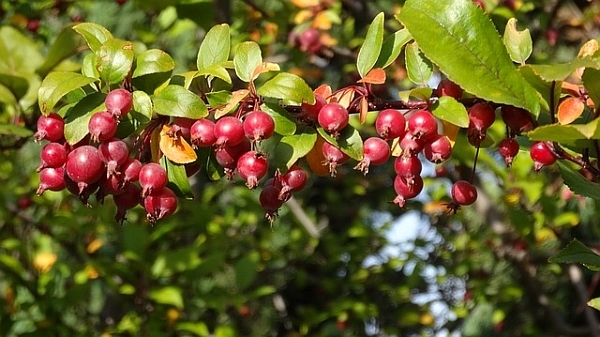 The red berries of most honeysuckle species are said to be mildly poisonous. I suggest harvesting lightly from several places, taking a little from each patch and leaving some flowers for the bees and moths. Take individual, open trumpets, leaving unopened flowers to bloom and leaving the stalk and flower base behind for berries to form. Always use good plant identification books to identify your finds to 100% certainty before eating them. Discover more about identifying and cooking with wild herbs and flowers on a Wild Feast foraging & cookery course. Get more wild food tips and updates on courses on Facebook and sign up for my e-newsletter for wild food recipes direct to your inbox (option to unsubscribe at any time). 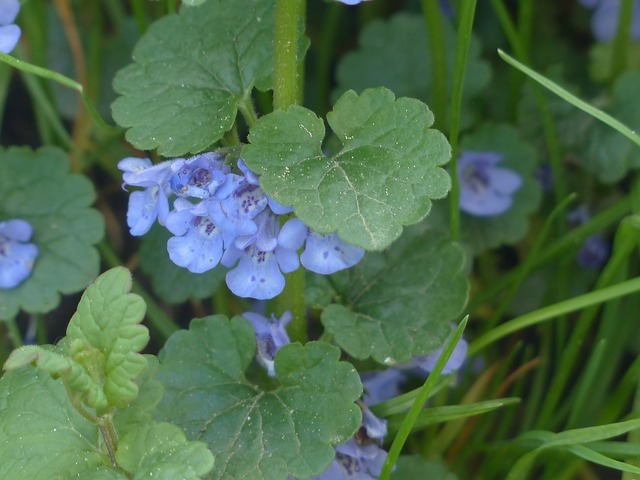 Ground ivy – a treasure, not a weed! Ground ivy (Glechoma hederacea) is in the mint family – it’s not a close relation of the 3-lobed, evergreen, climbing ivy (Hedera helix) that most people are likely to be more familiar with, the leaves and berries of which are poisonous. Ground ivy is in fact a common creeping herb that grows in grasslands, lawns, wooded areas, woodland edges, hedgerow bases, disturbed ground and around buildings. It provides good ground cover and is sometimes seen as a lawn pest, but learn to love it if you can for its aromatic herbal qualities and pretty little lavender-blue flowers which attract bees and butterflies. Like all members of the mint family, ground ivy has a square stem in cross section, and the softly hairy leaves, which are sometimes bronze in colour, are kidney-shaped with rounded teeth. Ground ivy was used for flavouring ale from Saxon times until the advent of hops to England, hence it’s old name of ‘ale-hoof’. 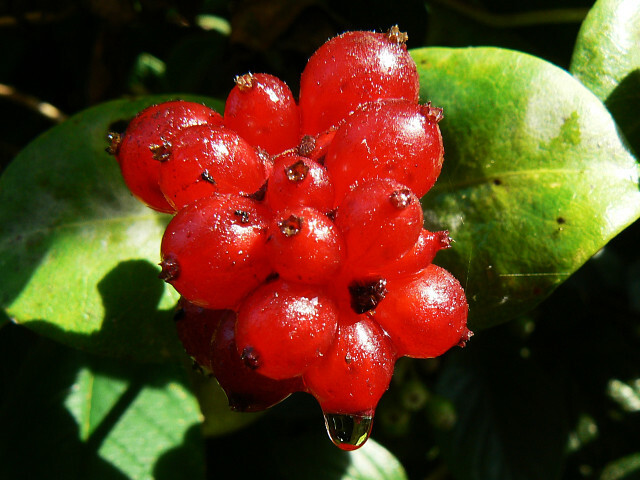 The plant is high in vitamin C, iron and flavonoid antioxidants. Research has shown it has anti-inflammatory and anti-cancer properties. However it’s also high in phenols, which may be toxic in large quantities – although this is likely to be decreased by cooking. So use it as a flavouring herb rather than a daily green. Ground ivy leaves can be used to flavour soups or casseroles. It has a gentle earthy, herbal flavour, with a fragrance somewhere between sage, mint and thyme, although less strongly aromatic, so you may want to use a bit more than you would if you were using those herbs. I chop it finely and mix with shredded ox-eye daisy leaves to make a herby coating for soft goat’s cheese, or a seasoning for fresh tomato bruschetta. 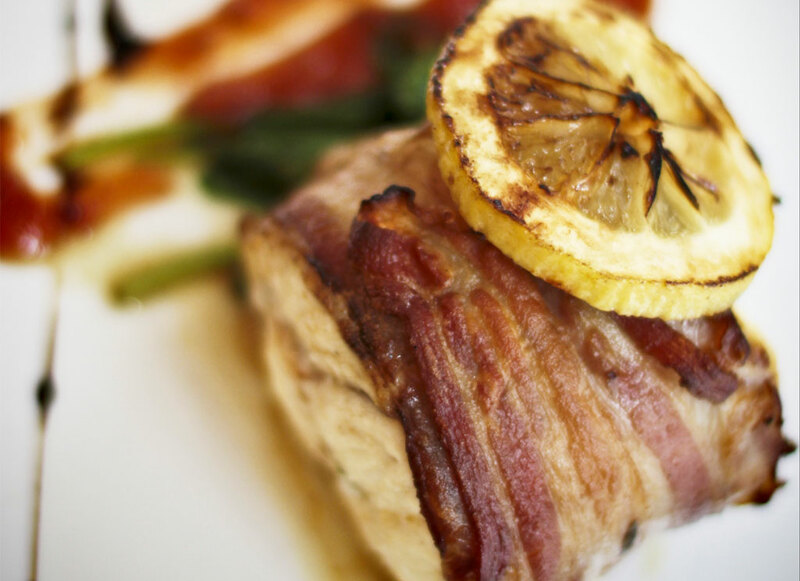 At my cookery demo at the Midsummer Fish Fair in Hastings, I used ground ivy to season local dogfish wrapped in pancetta ham, saltimbocca style, adapted from Pomegranate’s head chef Jamie Stephens’ Huss Saltimbocca recipe where he uses sage. Ground ivy is also delicious mixed in with minced meat to make burgers, or blended with mayo and horseradish as a dip for potato wedges (pictured below and inspired by Robin Harford of eatweeds.com). Infused in vinegar it can be used to make a herby vinaigrette. Always use good plant identification books to identify your finds to 100% certainty before eating them, and wash leaves thoroughly several times. Be careful plants have not been contaminated with chemicals. Discover more about identifying and cooking with wild herbs and flowers on a Wild Feast foraging & cookery course> book here. Get more wild food tips and updates on courses on Facebook and sign up for my e-newsletter for wild food recipes direct to your inbox (option to unsubscribe at any time). To make the most of the wild elder tree’s superb summer blooms while the elderflower season’s in full swing, I’ve gathered the coolest cocktail recipes from around the web using elderflower cordial. 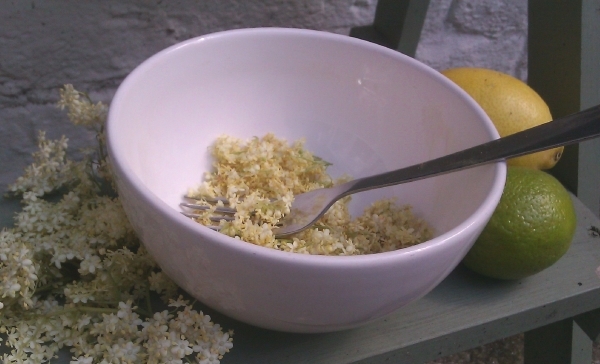 Making your own elderflower cordial is simple and inexpensive, I add lime for extra zing – here’s my elderflower cordial recipe. Elderflower’s refreshing and gentle floral flavour works well with gin and vodka, but also tequila, white rum, sparkling wine, cider and even beer. It marries well with fruit such as raspberry, strawberry, gooseberry, rhubarb, apple, pear and peach as well as citrus flavours. From UKTV’s Good Food website, this Gin, apple and elderflower cocktail is a long drink over ice with lime, mint and cloudy apple juice. 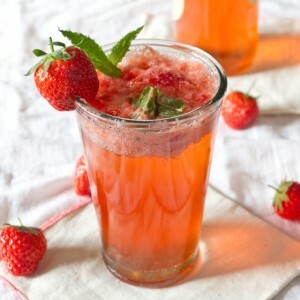 This Strawberry mint elderflower and gin cocktail (above) from Caroline Taylor’s blog, All That I’m Eating, is super summery with strawberries, gin and mint leaves, topped up with tonic or soda. For a refreshing and simple elderflower cocktail, try this elderflower collins from Absolut, with vodka, soda and lemon juice. Dreaming of a daiquiri? Try this Elderflower and mint version from UKTV’s Good Food channel, with white rum, freshly squeezed lime juice and mint. Fancy some fizz? Martha Stewart’s rhubarb elderflower bellini is a sparkling cocktail infused with the tart taste of rhubarb. Or how about this elderflower and lime spritzer from writer and TV cook, Jo Pratt, with sparkling wine, fresh lime juice and mint leaves. This Pear and elderflower martini is a vodkatini drink with pear juice from Scottish bartenders, Social and Cocktail. Last but not least, why not try mixing the exotic La Boheme with elderflower liqueur, vodka, black raspberry liqueur and cranberry? Discover more about identifying and cooking with wild herbs and flowers on a Wild Feast forage, cook and eat course. Get more wild food tips and updates on courses on Facebook and sign up for my e-newsletter for wild food recipes direct to your inbox (option to unsubscribe at any time). 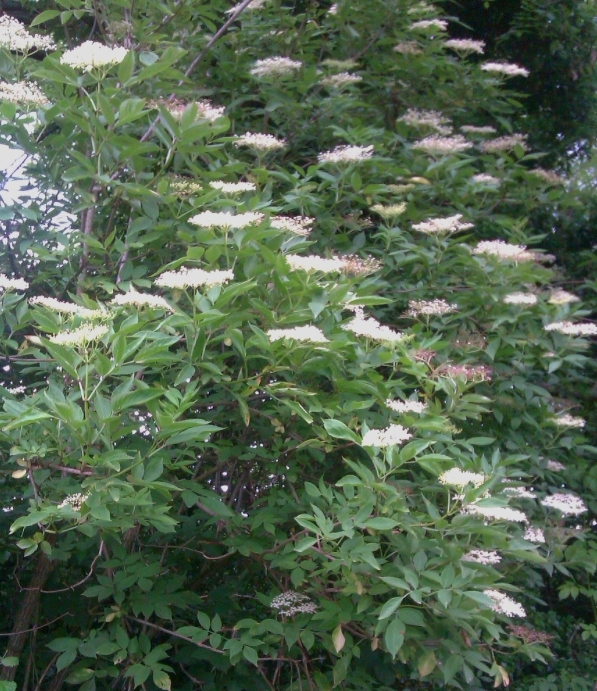 The flowers of the elder tree (Sambucus nigra) are one of my favourite edible blossoms. The creamy-white, saucer-shaped blooms have a unique, sweetly fragrant scent with notes of citrus and honey, and a superb, rich, floral flavour. 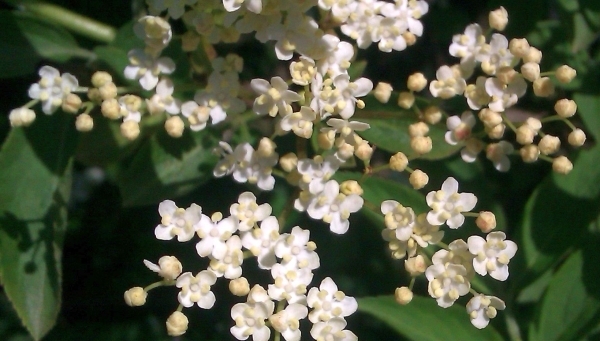 But the elderflower season doesn’t last for long – just a few weeks in late spring to early summer, so make the most of it while you can, taking care not to collect too many flowers from one spot so the tree can fruit later, providing food for wildlife as well as foraging human beings. The flowers are arranged in flat umbels of 10-30cm across, each one is made up of tiny florets with five petals and five pale-yellow anthers. The leaves of this small tree are formed of two or three pairs of (rather acrid and unpleasant-smelling) opposite leaflets with serrated edges, ending in a single terminal leaflet. The young twigs are green, becoming grey as they age, and splitting them reveals a soft white pith. The grey bark is grooved and corky-looking and can often be covered in green algae. The best time to pick the flowers is on a warm, dry day when the blooms are freshly open – as they get older the smell becomes less pleasant, even cat-wee like! Shake them gently to dislodge any insects. 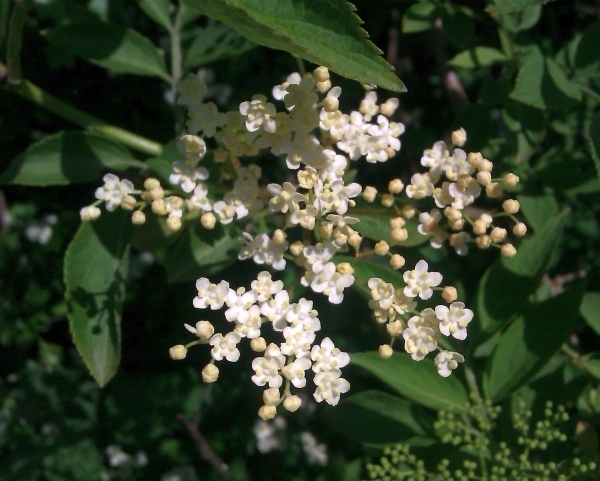 Elderflowers and the fruit that follows in late summer to early autumn, small globular purple-black elderberries, have been used in cooking for centuries. 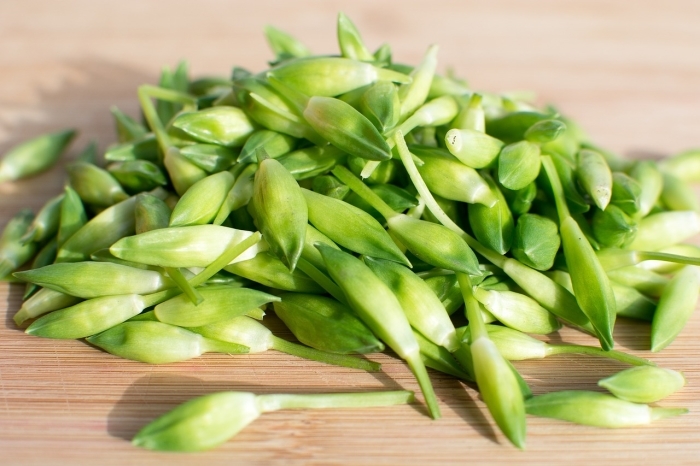 However, the stalks and leaves contain toxic cyano-compounds (denatured to some extent on cooking, but not especially tasty either) so flowers should be stripped away from as much of the green stalk as possible – this can be done with a fork or using your fingers. 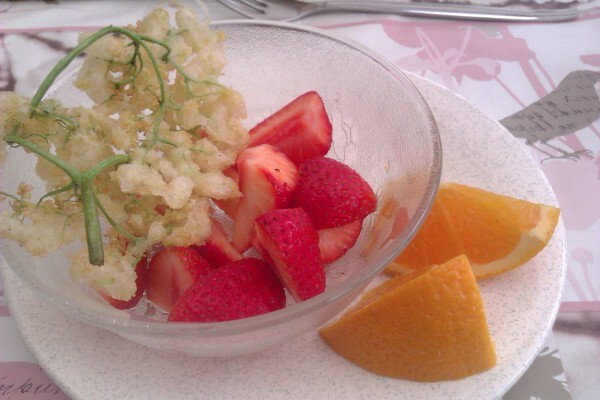 Elderflower fritters are a lacy, crispy treat: dip elderflowers in a light batter, briefly deep-fry, then sprinkle with icing sugar or elderflower cordial and serve with summer fruits or gooseberry compote. Note: it’s easier to leave some of the main flower stalk on for this dish, but don’t eat it. It’s simple to make your own elderflower cordial, I add lime for extra zing – here’s my elderflower cordial recipe, and here are some ideas for using elderflower cordial or liqueur in gorgeous cocktails. Elderflower ‘champagne’ is worth a try too, but watch out for exploding bottles – rather than using glass ones, I prefer reused plastic fizzy drink/sparkling water bottles (sterilised with sterilising tablets and water), or you can buy empty ones online or from wine-making shops. Keep the filled bottles in a cool, dark place keeping them away from anything you don’t want to be potentially sprayed, just in case! 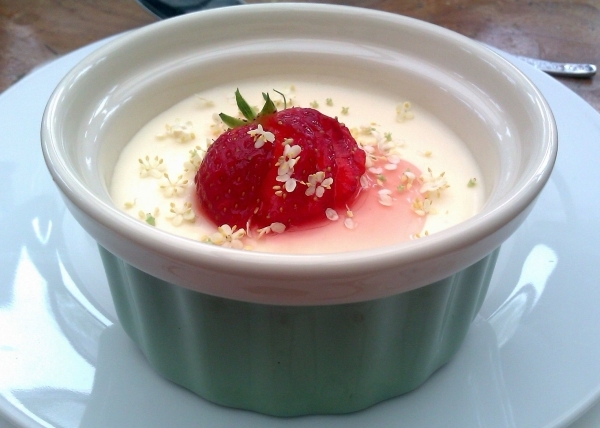 Elderflower can also be used to flavour sorbet, ice lollies, ice cream, custard, panna cotta, cakes, preserves, liqueurs and salad dressings. Nick Hales of St Clements restaurant in St. Leonards-on-Sea suggests pickling Hastings herring fillets in elderflower vinegar – I have to say I was bit sceptical, but I tried it and it works wonderfully! Always use good identification books to identify your finds to 100% certainty before eating them. Discover more about identifying and cooking with wild herbs and flowers on a Wild Feast forage, cook and eat course> book here. Get more wild food tips and updates on courses on Facebook and sign up for my e-newsletter for wild food recipes direct to your inbox (option to unsubscribe at any time). Photo: Gorse in East Sussex by Ian Cunliffe, licensed for reuse under Creative Commons Licence, via Wikimedia Commons. Gorse has been bringing striking golden-yellow brightness to the landscape since early January. Native common gorse (Ulex europaeus) is widespread on Sussex heaths, roadsides, railways and fields, flowering mainly from January to June. 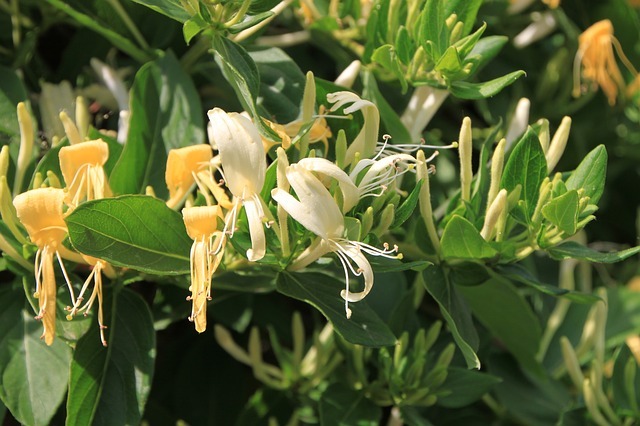 It’s a large, evergreen shrub covered in sharp, needle-like leaves with yellow coconut-perfumed flowers, the scent being more noticeable on sunny days. The flowers of this pea family shrub are edible and impart a distinctive coconutty, floral-vanilla flavour to infusions. The petals can be used as a decorative salad garnish, scattered over cakes, or infused in boiling water to make a tea. Or try crystallising petals with beaten egg white and fine sugar and spreading them out to dry in a warm place (this intensifies the coconut flavour), then sprinkling over ice cream. Ideally a gorse ice cream, made by heating the cream or milk of your recipe with a handful of gorse flowers, then cooling and leaving it overnight in the fridge before straining and using it to make the ice cream. 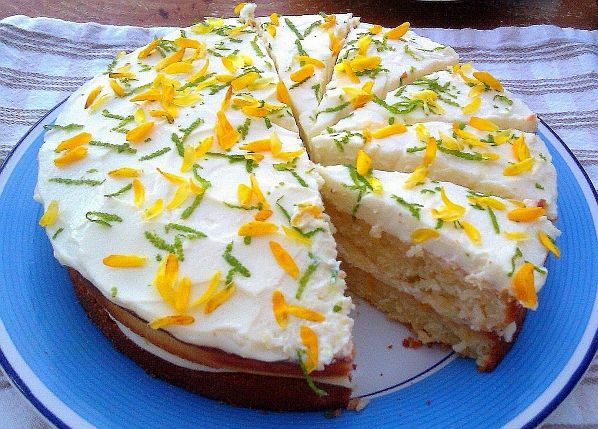 Above: my coconut and lime cake with gorse flower rum frosting, topped with fresh gorse petals. 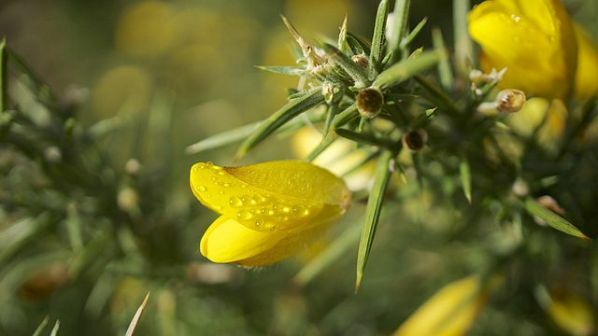 Gorse flowers are also used in the new breed of artisan British gins such as The Botanist, in winemaking, and to flavour whisky and beer. Try John Wright’s River Cottage Handbook recipe for gorse flower white rum, or infuse a handful in vodka for just a couple of days, before straining and adding sugar to taste. I also make a sunny yellow syrup with lime and orange, which is just gently floral flavoured with a slight hint of coconut and can be used in cocktails or as a drizzle. The flowers provide pollen for insects, especially on warmer winter days. Luckily picking too many is difficult as the bush is well-protected by sharp spines, so gathering them needs to be a slow, careful process – gloves are recommended, although I find it easier to get a feel for picking the blossoms without them, but caution is needed! 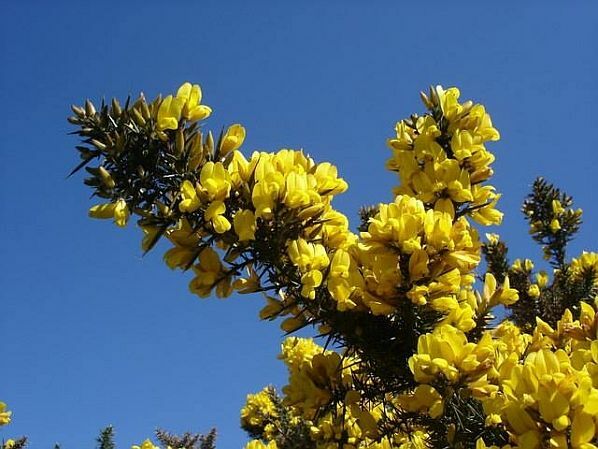 Take care not to confuse gorse with the poisonous laburnum tree, which is also in the pea family and has bright yellow flowers, however unlike gorse, the flowers hang down in clusters and the leaves are not sharp and needle-like. The foraging season never really ends as there are always edible hardy plants to be found. 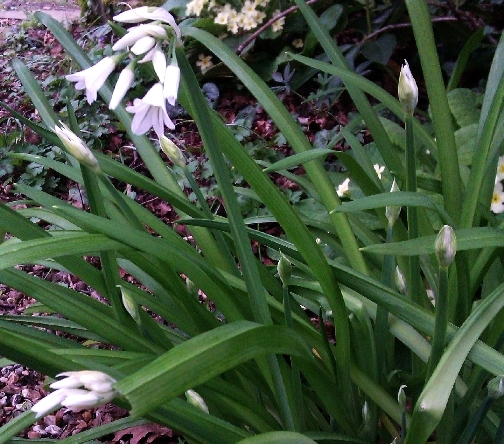 Right now, the leaves of three-cornered leek (Allium triquetrum) are tender and full-flavoured. It’s more subtle than brown onions, being a little leeky, with a smidgeon of spring onion and a cheeky hint of chive. When cooked it becomes milder and sweeter, so for maximum flavour eat young leaves raw, or add them near the end of cooking and wilt briefly. 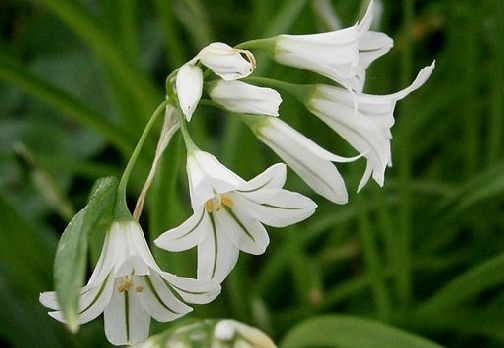 Three-cornered leek is a non-native plant appearing in hedgerows, flower beds and verges where it has naturalised in Southern England, having been introduced to the West Country in the 19th Century. An invasive plant, albeit a pretty one, it’s an offence to plant it (or otherwise cause it to grow) in the wild in the UK. Apparently it isn’t seen as a serious ecological threat, but it spreads easily (mainly via ants dispersing the seeds) and can become dominant where it grows, choking out native species, so eat it with abandon, pick the flowers, pickle the seed pods! It’s quite easy to identify, the leaves look a bit like grass or bluebells (although bluebells are poisonous), they’re strap-like with a keel along the centre of the underside and the giveaway is the onion smell when bruised. The flower stems are triangular in cross-section, hence ‘three-cornered’, and the flowers appear in March or April, looking for all the world like white bluebells, but with a narrow green stripe down the petal centre. As an Allium, three-cornered leek contains the goodness of onions in the sulphur compounds that can help reduce cholesterol, protect the circulatory system and which have anti-bacterial and anti-fungal properties; as well as containing saponins and flavonoids, potential antioxidants and anti-cancer agents. I use the leaves like chives, spring onions or leeks – chopped in mash, blended with butter on new potatoes or steak, in a pesto, in soups and in tarts. While young and tender, the chopped leaves are great raw in salads or home-made coleslaw. The juicy edible flowers make an attractive onion-y garnish for savoury dishes and salads too. The flower buds make a pretty pickle in hot, spiced vinegar, and the seed pods pickle well too, but catch them early before the seeds harden! 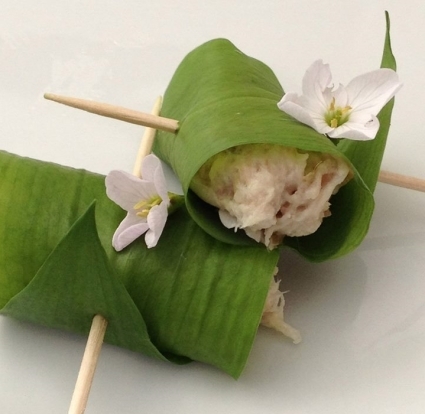 Try my tasty three-cornered leek guacamole – recipe below. I can’t get enough of fresh-flavoured, healthy guac, and three-cornered leek is a perfect ingredient for it as raw onion and garlic can overpower the delicate taste of avocado. Handful well-washed three-cornered leek leaves/bulbs (2-4 tbsp). 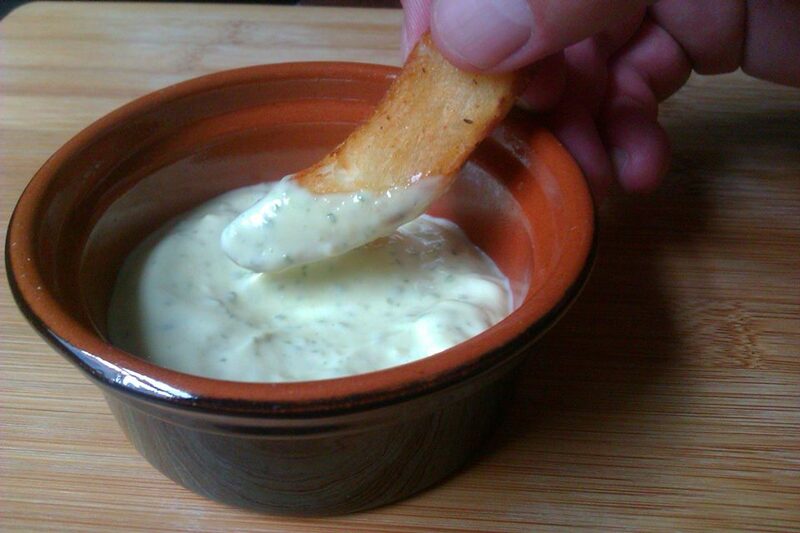 1 tbsp sour cream (optional). 0.5 tsp white wine vinegar. Finely chop the three-cornered leek and the fresh chilli. Finely dice the tomato, removing the seeds. Mash the flesh of one avocado and dice the flesh of the other. Tip these ingredients into the bowl reserving enough chopped three-cornered leek leaves to garnish. Add the lime juice, vinegar, tabasco and sour cream (if using), mix then season with salt and pepper. If not serving straight away, cover with cling film pressed right onto the surface of the guac (to help prevent it oxidising and going brown), and refrigerate until needed. Serve scattered with the remaining three-cornered leek leaves, with tortilla chips or nachos, or as an ingredient in tacos or burritos. Always use a good plant identification book when foraging and wash leaves thoroughly several times. Be careful plants have not been contaminated with chemicals.